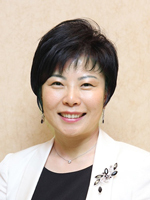 Jung Hieh Shon, President of Hanaroadcom, a marketing and PR consultancy in Seoul, South Korea, won the Gold Stevie Award for Creative Executive of the Year in the creative awards categories of The 2013 International Business Awards. We asked her about the experience of winning a Stevie Award, and what her company’s goals are for 2014. The entry deadline for the Asia-Pacific Stevie Awards is February 19. These awards are open to all organizations in the 22 nations of the Asia-Pacific region. The early-bird entry deadline for The International Business Awards, which are open to all organizations worldwide, is April 16. Jung Hieh Shon is the CEO of a 19-year-old company that has won a Stevie® Award for seven years in a row. She herself has also been named “Creative Executive of the Year” for six years in succession. Working during the day and studying at night for fifteen years earned her professional degrees and a good knowledge of English, advertising and PR, social welfare, visual design, and real estate. She currently works as a PR and Design advisor to a number of government organizations and associations. Hanaroadcom is a consultancy that helps organizations with their marketing activities through the effective and creative use of diverse promotional tools. Its areas of specialty include brochures, in-house magazines, brand development, communications solutions, and social media. Hanaroadcom is one of only a few companies to have won in the International Business Awards seven years in succession. The company has also achieved recognition in several Korean awards. Hanaroadcom’s customers are mainly Korean government organizations, public institutions, and large companies. It also has partnerships with overseas government organizations and global enterprises. For more information, go to www.hanaroad.com.